Straw man is a device or trope used in arguments. The phrase describes a misrepresentation or false version of an argument. This is an informal fallacy. The reasoning is flawed because it distorts issues. A false version of the other side's argument is proved wrong and it looks as if the real argument has been proved wrong. The straw man argument can have many forms. The fallacy of attacking a straw man can also arise from an honest mistake. The origins of the term are unclear. An 1898 definition refers to men who stood outside courthouses with a straw in their shoe in order to indicate their willingness to be hired to give evidence in a court trial. 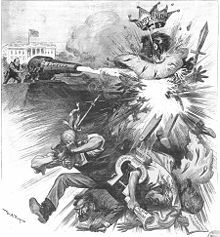 In the 1900 US presidential election campaign, the issue of Imperialism became a "straw man" issue when President McKinley accepted his party's nomination. Cartoonist William Allen Rogers focused on the destruction of this issue in a September issue of Harper's Weekly. ↑ Sinnott-Armstrong, Walter and Robert J. Fogelin. (2009). Understanding Arguments: An Introduction to Informal Logic. p. 390. ↑ Brewer, E. Cobham. (1898). "Man of Straw," Dictionary of Phrase and Fable; retrieved 20123-1-10. ↑ Rogers, William Allen. "Smashed!" Harper's Weekly, September 22, 1900, p. 881; retrieved 2013-1-10.